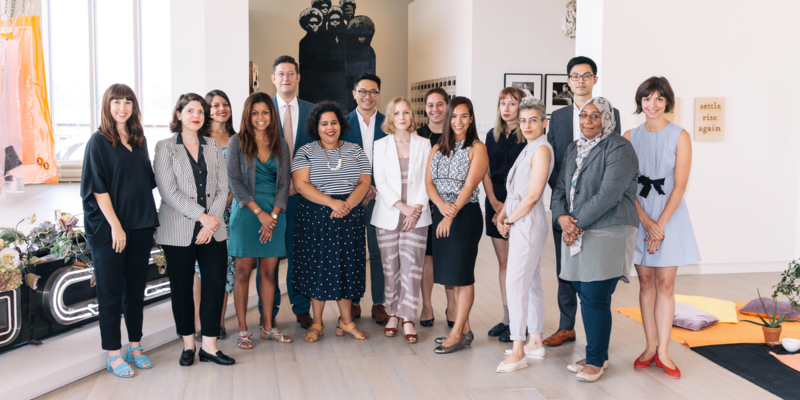 The 2018 CCL/Mellon Foundation Seminar students (from left to right) at the Brooklyn Museum: Anni Pullagura, Miranda Saylor, Jun Nakamura, Marina Tyquiengco, Xuxa Rodríguez, Chloé Madeleine Pelletier, Galina Olmsted, Ashley Dimmig, J. English Cook, Leila Anne Harris, Alisa Chiles, Xiaohan Du, Rachel Patt, Diana Mellon, and Christopher Green. Photo by Hollis Johnson. 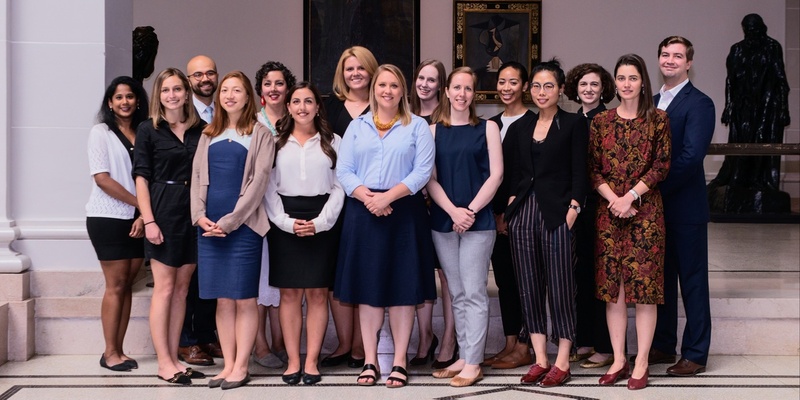 The CCL/Mellon Seminar in Curatorial Practice provides art history Ph.D. students in all fields of specialty with an in-depth introduction to working in museums. The two-week intensive combines exhibition and collection tours, conversations with curators and cultural leaders, and group exercises at New York City institutions. 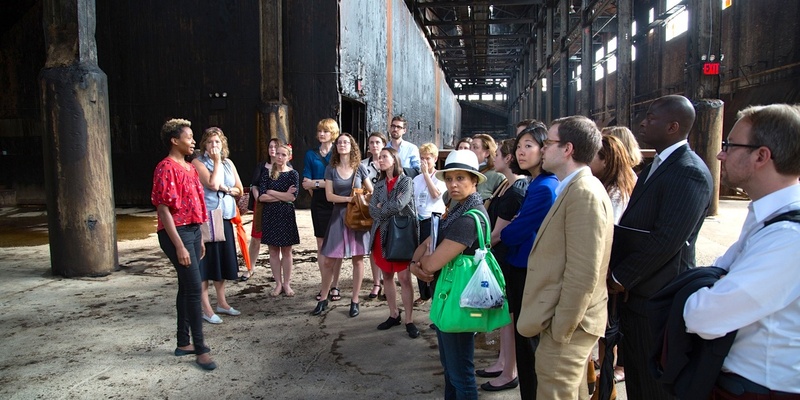 With support from a grant from The Andrew W. Mellon Foundation, the Seminar provides a critical training opportunity for emerging curatorial professionals. Twelve to fifteen students annually receive the extraordinary opportunity to observe, analyze, and engage in the critical responsibilities of museums through a range of institutional contexts. Candidates for the Seminar should be full-time students enrolled in a doctoral program (or its equivalent) in art history, or a related field of study with significant coursework in art history. Eligible candidates will have completed their oral examinations before the program begins and will have, at minimum, determined the topic of their dissertation research. Students who will have successfully defended their dissertations prior to the start of the program are not eligible to apply. CCL seeks an inclusive group of participants from around the United States and abroad. The ideal candidate has a strong academic record and demonstrates intellectual and professional curiosity, an interest in exploring the curatorial field, and the ability to work well with others. Previous museum experience is common, but not required. The two weeks of the Seminar expose students to the critical responsibilities of a curator. Sessions are held in museum galleries and behind the scenes of art institutions across New York City. Students engage with directors, curators, conservators, registrars, educators, and trustees, among others, and are introduced to the wide variety of roles that contribute to the operations of museums today. Lessons and conversations familiarize participants with a range of curatorial career paths and institutional models, exploring the ideas behind acquisition, care, interpretation, and display as they relate to permanent collections and temporary exhibitions. Discussions are complemented by coursework led by professors from Columbia Business School, which covers fundamental business principles in order to better understand organizational models and managerial leadership. Students are also assigned a team practicum exercise that asks them to critically assess the mission and program of a New York City institution and to apply skills and perspectives gained from the Seminar. In addition, each student is matched with a mentor curator from a New York City museum for individualized one-on-one meetings. The 2019 CCL/Mellon Foundation Seminar will take place from July 14–26, 2019. The schedule includes weekday programming from approximately 9AM to 8PM, as well as coursework and independent site visits to be completed during the weekend. The program is a full-time intensive commitment. Students will attend all scheduled program sessions, and may not schedule other meetings or activities during the two weeks of the Seminar. Students with any prior engagements during the two weeks of the Seminar need not apply.